We recently celebrated my husband's 31st birthday. Don't even get me started on what kind of a trip that is to me. Actually do get me started, but let's wait until another blog post- one I plan on writing ALL about his lovely birthday day weekend. All I want to talk about in this post is his love for cinnamon rolls. I promise you, with all joking set aside for a moment- this man of mine would consume cinnamon rolls every single day (all day) if I let him. I'm not even going to try and sound like a cool wife by saying something like "Oh, he can eat whatever he wants, whenever he wants". I have no shame here- when it comes to cinnamon rolls (you know, the 880 calorie PER cinnamon roll) he would eat one multiple times a day. He doesn't care that almost half his caloric intake is gone in one item. It's crazy. Cray even. Since I want him around well into his 180th year of life and not die of sugar/fat overload while in his 30's, I kindly and lovingly ask him to hone this little food obsession down to "every now and then". He obliges ;) We're good like that. Me: "Hey!! (*Insert super excited smile and movement*) What kind of cake would you like me to make you for your birthday???" I am not kidding. So that year that's exactly what he got- literally a pan of hot, steaming, gooey, sticky cinnamon rolls- with a candle on them. Kind of boring if you ask me....but he was as happy as could be. The next year? Same request, but this time I let them cool a tad and stacked them up like a cake. Year after that? SAME REQUEST...and so on and so forth. Here's the thing...call me selfish...but come last year, I was tired of eating a cinnamon roll. I wanted to have cake, darn it! Not wanting to ruin his birthday from then until he was 180 and also wanting to present myself with a nice little challenge- I tried and tested and acted all "mad scientist" until I developed the perfect Cinnamon Roll Cake. HAHA! Take THAT you lousy, lame, boring stupid cinnamon roll! That's exactly what I did. Last year we had cinnamon rolls, but in a slice-of-cake-way that made us both happy. I'm not going to lie- I was a tad nervous. See, this man of mine has been consuming these rolls for a LONG time. He's no stranger to what a good one should taste like. He's also not afraid to tell me when "It's just not the same..." So I tested my new recipe on him a month before his big day. The verdict? I received a wide-eyed, jaw-dropping, "Oh my gosh" response. He loved it. Best. Thing. Ever. You might remember this post from last year? My husband then tested out my new recipe by baking it HIMSELF (gasp!) for his work's cupcake challenge. I couldn't touch a thing, or else he'd be disqualified...so I sat (hardest half hour of my life) and verbally helped as much as I could. 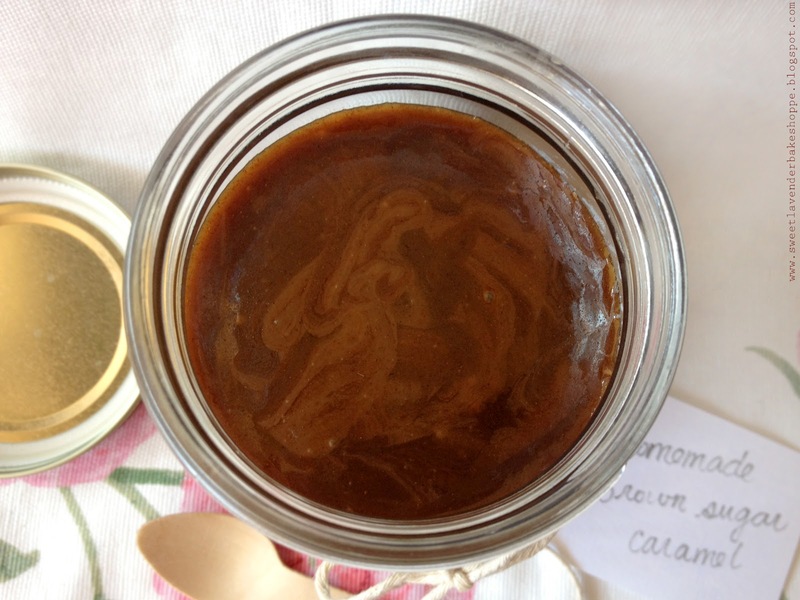 SOooOooOOooOooo after I posted that little fun blog, I received a couple of inquiries wanting my recipe for the cinnamon brown sugar caramel I used in the cupcakes (and also on the cakes). Wanting to make sure the recipe was in tip top shape, I waited until this year to bake the cake (once again) for my husband's birthday request and make sure the recipe worked. Yes, he requested the same cake as last year :) Worked like a charm! I made way more than needed (for my cake and cupcakes) so that I could jar it, gift it, and let him spread this delicious sweetness on whatever he darn well wanted to, far after his birthday. So far it's been stirred into oatmeal and spread on toast for a late night "kind of a cinnamon roll" treat. With no candy thermometer needed, this stuff is super easy to make! 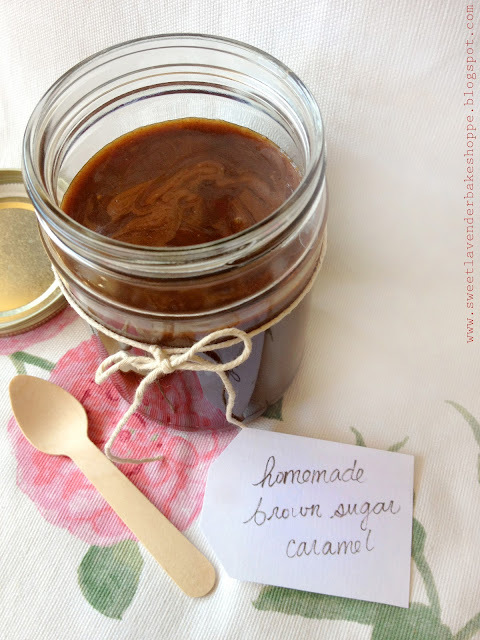 So, without further adieu- my Cinnamon Brown Sugar Caramel. Please excuse these lame-ski pictures...I was in a mad rush! 1. First picture: In a medium saucepot, over medium heat, add your butter and brown sugar. Cook, stirring occasionally until your butter has melted. 2. Second picture: Once butter has melted you will begin to see it rise to the surface, that's ok- once the brown sugar melts, it will all incorporate :) Continue to simmer and cook over medium-LOW heat, stirring frequently (but not constantly) until the brown sugar has melted and the butter and sugar have incorporated fully together- about 6-7 minutes. If your caramel is bubbling too violently, turn your heat down to low- you want a constant bubbling simmer. 3. Third picture: Remove pan off heat and add your vanilla extract, salt, and milk, stirring constantly. Add back to medium-low heat and bring back to a boil. Next whisk in your ground cinnamon and cook, stirring constantly, one more minute. 4. Let cool slightly before adding to cake layers, filling cupcakes, or pouring into jars. 5. Store in fridge, in air tight container for up to 2 weeks. It will solidify when in fridge. To reheat and make pourable, simply spoon out what you need and gently microwave, or even better warm up over a double boiler over a gentle simmering pot of water on stove. Drizzle this stuff over apples, ice cream, popcorn...waffles, pancakes...your hand...whatever! BY THE WAY!!! I forgot to tell you guys! 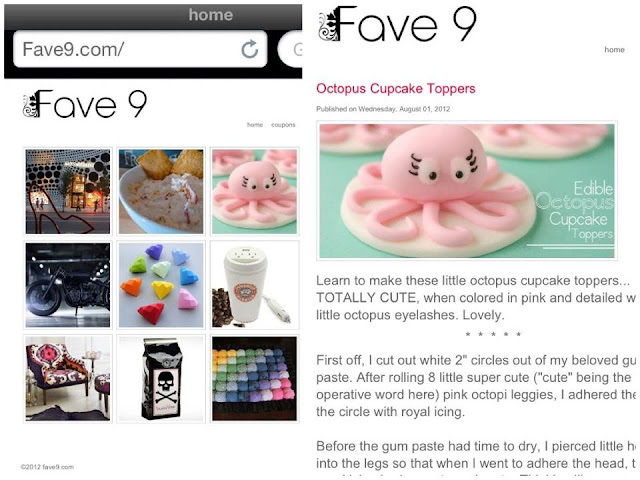 On Wednesday I was emailed and told I was featured on this super neat blog- Fave 9!!! Ok...seriously, this place is awesome. Every Wednesday they showcase 9 super amazing crafts/items/recipes/etc that you just need to know about/have in your lives at once. I am so honored! You can find out and see our little octopi here :) Thanks, guys!! This is one gorgeous recipe! My goodness, that looks delicious.